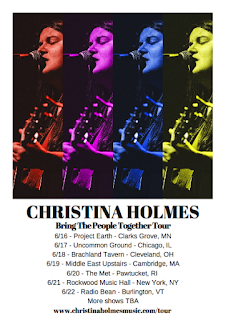 Singer/Songwriter Christina Holmes has announced her first headline tour in support of her second studio album, "Stand Up". The tour, dubbed the "Bring The People Together Tour," will begin with a performance on the main stage of the Project Earth festival on June 16th and will make stops in Chicago, Cleveland, Boston, and Burlington. Christina will be inviting local musicians to perform on each date of the tour. 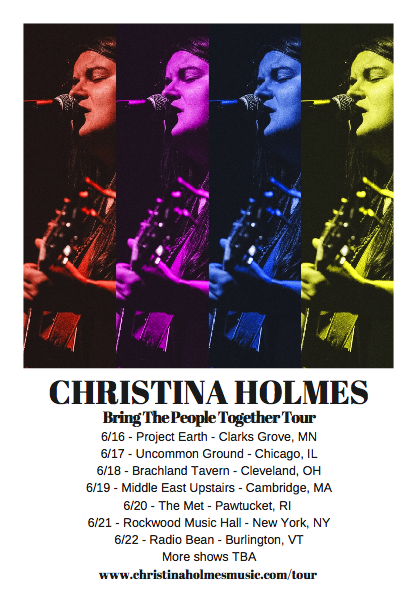 Tickets are now on sale here: http://www.christinaholmesmusic.com/tour.html. "It's been a long time coming but I wouldn't have it any other way" says Christina about this tour. "I am so excited to play these headline shows and showcase some local talent I've met along my journey. Everyone is looking for someone to give them a chance. Many have believed in me and given me the chance to shine, now it’s my turn to do the same!"